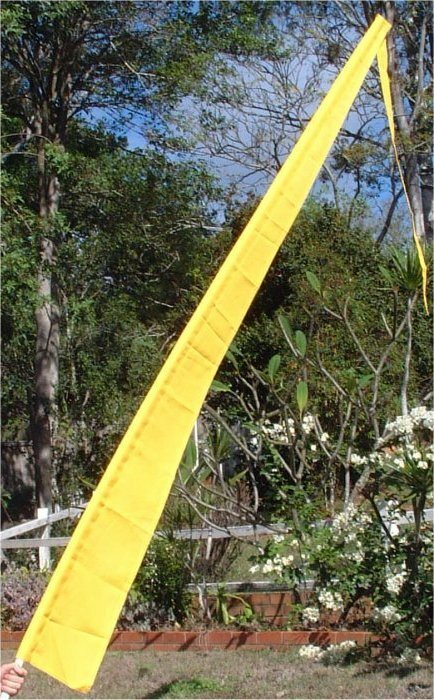 You can use electrical conduit, dowel (pictured), bamboo stick as a pole for a Bali flag - anything with some flexibility. Any hardware store can help you. We do not sell poles. Bali flags in nine exciting colours. Our standard fabric is high quality outdoor flag bunting (polyester). If the flag is for occasional or sfort term use, other types of material may be considered. Please enquire. To achieve the best price for you we cut our Bali flags in twos or fours, depending on the width of the flags. Odd numbers can be made; please ask for a quote. Delivery charge of $10.00 plus GST will be added within Australia. Happy to post overseas, please ask for a quote. Other sizes can be made. Your logo or text can be added for extra charge. Please email us for a quote. We have some colours in stock with no minimum order requirement, please enquire. Bali flags look great. The drawing above gives you an idea about the dimensions. The 350x4000mm flag (pictured left) is made from durable polyester bunting - suitable for outdoor use. Electrical conduit (in picture) is slightly flexible, and displays your Bali flags beautifully. You can buy it from most hardware stores. We do not supply poles. 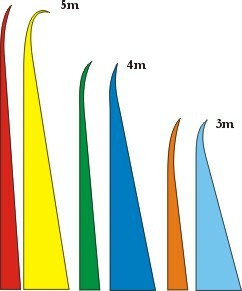 Length of the pole depends on how much of the top of the flag you want to leave hanging loose. Width of the rod sleeve varies slightly, but is usually at least 50mm.